Mention the term Rapid Prototyping or just “RP” and people immediately think you are referring to 3D printed parts made by SLS, SLA or by FDM processes. What’s really meant here is Additive Manufacturing or AM, where parts are basically created by the build-up of material rather than subtracted by machining material away from a bigger piece (collectively “subtractive processes”). The implications for the designer of using one technique over the other could not be more profound. In one technique we strive to minimise the amount of material we take off whereas in the other we try not to put it on! 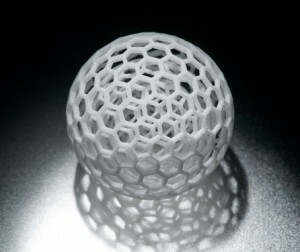 Traditionally, designers of parts to be produced by subtractive processes have obtained shape-representative models in a matter of days through AM techniques. As the materials are not necessarily representative of the volume parts, the term “Rapid Prototyping” seems to describe the service well. Traditional subtractive processes such as turning and milling bring with them constraints due to the shape and the nature of the generated surface made by the path the tool takes relative to the material. Additive processes work in an entirely different way, building geometry up in layers. Using this technique it is possible to make what would seem to have been impossible when only subtractive processes were available. This fundamental difference is the key to using AM most effectively: designers are not constrained to creating features that can be generated using a subtractive process but can simply put geometry only where it is needed. In recent posts we have discussed how we can get routinely get precision parts machined in a matter of just 2-3 days and parts moulded in 3-5, including manufacture of the tooling. Making a few parts in super-quick time comes at a price but sometimes it is necessary and is warranted. Given that these traditional processes can be both rapid and may be used to produce prototypes, aren’t precision machining and Plastic Injection Moulding processes also potentially RP processes? Additive Manufacturing processes can in fact be quite slow and not rapid at all. SLA builds typically take several hours and perhaps the best part of a day. What really makes the process “rapid” is not the process itself, but the response time of the companies who perform the service. The truth of the matter is that when I look to place an order for a part made by an Additive Manufacturing or rapid machining bureau I would expect to get a quotation within hours and the part delivered within a few days. Conversely, when we look to place an order for precision machined parts it would be normal to wait for 3-4 days to get a quote and the goods be delivered in 4-5 weeks. Definitely not whet you would call “Rapid”. So, let’s re-think the use of the term Rapid Prototyping. It is not so much do with the process of the materials but it is in the mind-set of the people who are providing the service.